The liberal media went wild attacking President Donald Trump for serving fast food to the Clemson Tigers, when they visited the White House on Monday. With the shutdown still in full swing, White House staff is at a minimum, and it appears that the food service personnel are also on furlough. Trump paid for the entire feast out of his own pocket. Trump also said that he thought the team would enjoy a little “fun” time during their White House visit. Of course, Clemson has become somewhat famous for its fast food connection with breakout quarterback Trevor Lawrence being a huge fan of Chick-fil-A. For years Lawrence has prepared to meet his opponents by studying game films while eating Chick-fil-A. He has kept that up at college, too. “In Clemson, they say he does the same, poring over Notre Dame and Alabama defensive cut-ups while snacking on Chick-n-Minis,” ESPN’s Ryan McGee reported. Indeed, after the big White House visit, Lawrence said he loved the whole thing and said he can’t wait to come back. The press still went wild attacking the president for his hosting duty. Sports blogger Robert Littal attacked Trump for “believing” the “stereotypes” about college kids. “Here is the thing Trump believes every single stereotype that is out there, so the stereotype that college kids-athletes just eat fast food all the time is all he knows. These college football powerhouses are billion dollar businesses much more steak than 4 for $4,” he tweeted. Here is the thing Trump believes every single stereotype that is out there, so the stereotype that college kids-athletes just eat fast food all the time is all he knows. These college football powerhouses are billion dollar businesses much more steak than 4 for $4. Another virulent anti-Trumper, Dr. Eugene Gu, claimed Trump was using fast food as a way to “troll” everyone over the shutdown. I knew it. 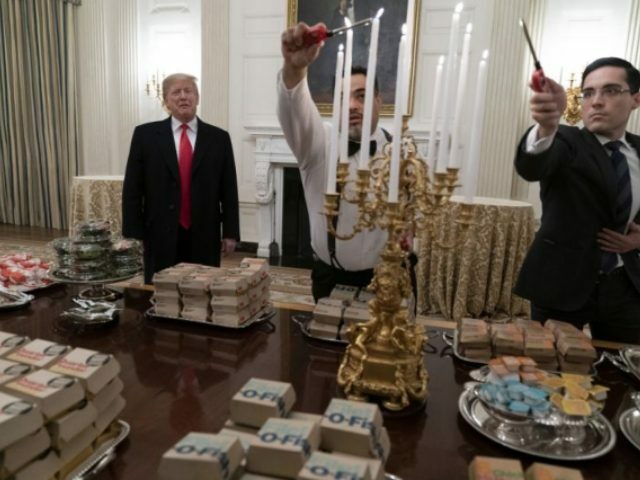 McDonald Trump intentionally fed the Clemson Tigers cheap fast food and gave some fake presentation to the media to troll the everyone as a propaganda stunt to highlight the shutdown. Never underestimate Trump. He’s the king of trolls. Also, former NFL running back Reggie Bush claimed the meal was a “slap in the face” to the players.